The Kingdom of Bahrain is all set to embrace another major sporting event as the 2019 Bahrain Sports Day kicks off in different parts of Bahrain today. 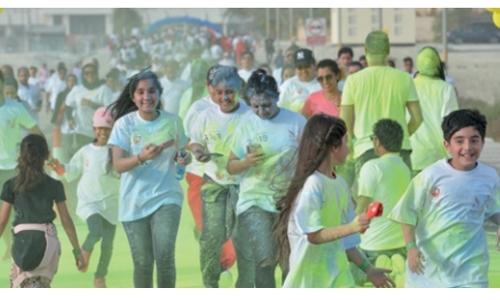 Organisations representing government and non-government parties, including ministries, agencies, institutions, banks, financial institutions and companies, will engage in a packed sports programme, prepared by the Bahrain Olympic Committee (BOC), the event organisers. Commencing at 3pm, the festivities will take place in purpose-built sports village in each of the country’s four governorates, with the main village being located at Isa Sports City, near the National Stadium in Riffa. The first of the activities lined up today will be a cycling race, to be followed by a colour run at 4.15pm. The sports village, which promises to attract all members of the family, features food courts, kids zone, a theatre hosting entertaining and music shows, a special studio for Bahrain Television, in addition to a dedicated area to host different sporting competitions. They include table tennis, horse riding, traditional inherited sports, sports for people with disabilities, 3x3 basketball, Spartan, physical fitness, cross fit, mixed martial arts and American football, besides a corner for productive families, an inquiries reception and paramedics services. The sports village also includes other sets of programmes like free medical consultations, sports shows, discounts on a number of products for the visitors, sports competitions and many other entertaining activities for children, in addition to valuable prizes and large raffle draws for the public. Furthermore, BOC has prepared additional programme for its staff today – in cooperation with the Supreme Council for Youth and Sports – prior to the start of the activities at Manama Club in Juffair. Meanwhile, Supreme Council for Youth and Sports assistant secretary general, BOC secretary general and 209 Bahrain Sports Day Organising Committee chairman Abdulrahman Askar the sports day reflects the value of sport and health, and called to raise awareness in our societies to preserve the future of our generations.